Greenville is one of the best cities in Eastern North Carolina to operate a small business. However, in order to operate your small business, you must have a nice accessible location to operate from. That’s where we at Eastern Trust Real Estate Company, LLC comes into the fold. We have many commercial spots for lease in Greenville, NC. One location, in particular, is at 241 Commerce St. 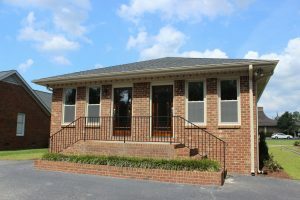 Located on Commerce Street in Greenville this office is in the heart of Greenville’s business district. Commerce Street is less than a mile from East Arlington Boulevard and South East Greenville Boulevard where the traffic can reach up to 30,000 cars per year. At 1,098 sqft this location has three offices varying in sizes, a large reception area, bathroom, and file room. Although this building was built in 1984 the office suite was completely remodeled in 2014 with custom flooring, new HVAC system, all new fixtures, lighting, and bathrooms. 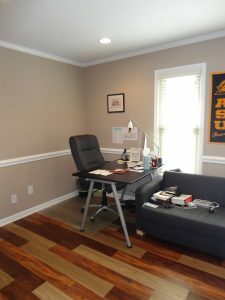 This office space also boasts custom flooring throughout, updated paint colors, and high finish level. The leasing term for this office suite is 1 year. The rental rate is $10.38/Square Foot/Year. This completely updated office is in an excellent location and is truly one of the nicest in town. For more information about commercial properties for lease in Greenville, NC feel free to visit our website or contact us with any questions! In addition to real estate, we also offer services such as 1031 exchange, valuation and advisory, development advisory, investment sales, landlord representation, tenant representation and brokerage services. We have over 20 years of combined experience at work for you and your needs. We encourage you to reach out to us for any questions you might have. We’re here to serve you!